As a new instructor sometimes I get really nervous about teaching. I feel overwhelmed at all there is to know, feel pressured by myself to be this amazing teacher full of profound knowledge and wisdom, feel inadequate. At times like these I need to remember that really, all the kids want to do is just ride a horse. And really, all they need to do is ride a horse. They usually aren’t looking to me to teach them amazing horseback riding skills or lead them through an amazing entertaining time on horseback. They just want to and need to be on and with this huge, moving, living animal. And that is good for them, physically spiritually and mentally, regardless of what my lesson plan is. Isn’t it the same for you? 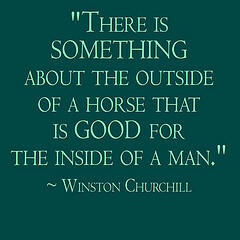 I remember being little, when just being around or on a horse made me happy (it still does). Of course I wanted to feel safe, and secure, and knowledgeable on a horse too, though I didn’t realize it…but most of all, I just wanted to be on a horse. 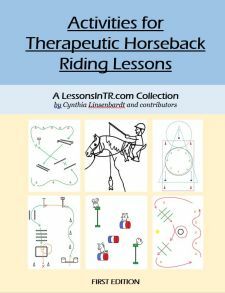 So remember, although the job of an instructor is huge – lesson planning, safety, skill teaching, game coordinating, and everything else – in the end, just having the kid on a horse, getting the input of motion and feeling connected, is huge! As long as the kid doesn’t get hurt, and ends with a smile, your lesson was a success!